Pierre: “That is always so much fun! 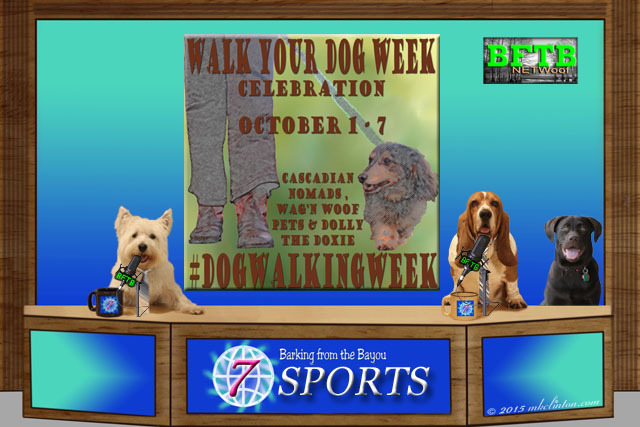 In the sports department, we are glad to announce that we are smack dab in the middle of National Walk Your Dog Week. Walking is one of our favorite things to do as a family. Thankfully the weather has cooled down just in time for us to take part in the challenge. You can find more information and win prizes from the gangs at Cascadian Nomads, Wag N Woof Pets, and Dolly the Doxie. Have a great week friends!! A tiny pig?? But wouldn't dat just mean less bacon??? BOL BOL! I agree wif y'all, I wouldn't want to be cloned either. I's one of a kind. Oh yes, Dad told me about that brave doggie, it wasn't our Lily was it? And if it was...where was Edward? Great news coverage, pals. I do not think my Ma would want a clone of me as the clone would never be able to be as good as the original! BOL And now tiny pigs?!? Come on...when will humans stop messing with animals?!? Ah, this series is great. That was a brave puppy. I laughed because Cocoa is described as a bear hunter. No fear!! Cloning causes a lot of pain to the surrogate mother. It is animal cruelty and should be stopped. Thanks for mentioning our FitDog Friday Fall Fitness Challenge. Sounds like lots of big events going on this month! As for bears, did you know the Kuvasz would actually go after bears in the wild. They are tough dogs, but these days, I don't think Katie would try it. Have a great week! Messing with genetics is just a little creepy. Great stories, guys! Clones? Now that's just scary. There's so much fun stuff going on! Thanks for sharing about our Dog Walking Week celebration. We think it's creepy and wrong to mess with DNA. But hey, even if we believed, we don't have $100,000 lying around to clone any of our pets! We don't think too much about cloning, but we do think that was one brave Frenchie!! Another great report. That little dog sure was brave to take on those bears. 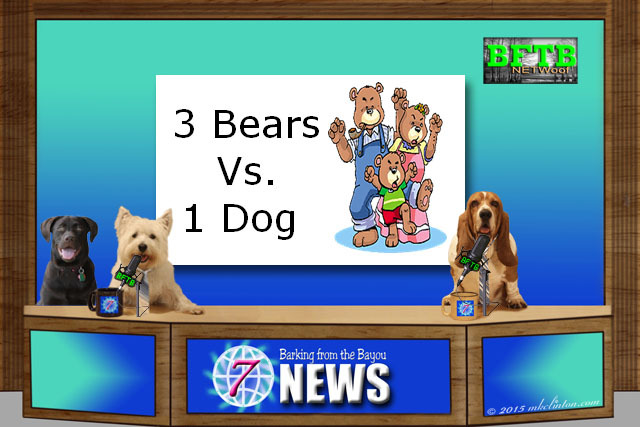 Every time I see that video of the dog and the 2 bears, I think that was a very lucky dog. One swipe and ... I hate to think of it. Thankfully the bears were scaredy bears. That whole messing with Mother Nature thing is a bad idea. We all know "she" has no sense of humor and when you least expect it...BAM!